Features: Suitable for MTB and road bikes. Soft and comfortable. Good shock absorption and maximum firmness. Soft and comfortable cushion for long travel. Vented ergonomic channel relieves pressure. Best choice for riding essentials. Descriptions: Get you a great feeling while riding. You will not feel tired for long time riding. 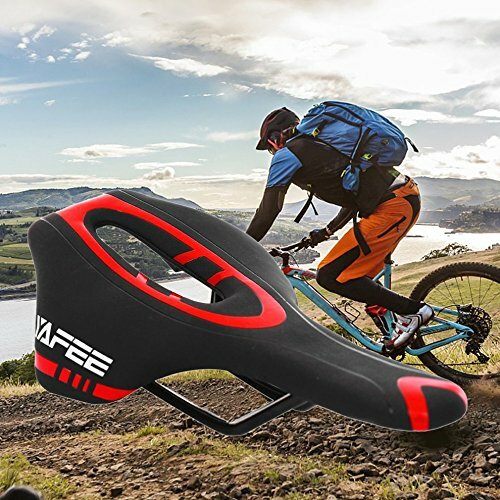 Specifications: Brand: YAFEE Model: YF-1064 Material: Polyurethane & PVC & PP Color: black & white, black & red, black & yellow, black & blue, black & green Size: 290x145MM Package Include: 1 x Bike Seat Bicycle Saddle Notes: Due to the difference between different monitors, the picture may not reflect the actual color of the item. We guarantee the style is the same as shown in the pictures.